Levite Genes : Kathie Hill Music, LLC, Making music with and for kids for over 25 years! Try this creative lesson in church music history on for size! Levite Genes is an easy-to-perform musical that will not only lead your children to an understanding of the privilege involved in leading worship and praise but will also explain the need for a personal desire to worship our Lord. Ages: 1st grade and up with several songs easy enough for preschoolers. This was my first musical that I put on written by KHill. Her guidance, ideas on staging, dancing and movement make it very do-able for any director. The songs, catchy melodies, message and great words make it an A+ musical. I highly recommend this one if you have a limited budget, space and/or experience. It sends a wonderful message and will be loved by all! This Kathie Hill musical was very educational as far as biblical history and of course, great music and fun to perform! Kathie’s Note: To teach kids to lead in praise and worship, I wanted them to understand who the first worship leaders were. This musical not only introduces Old Testament information on the Levites, but through great arrangements of “Holy, Holy, Holy,” “Worthy of Worship” and “He is Good” helps them learn of God’s attributes and the reasons WHY we praise God. Levite Genes works both as a musical with drama or a great praise and worship concert using just the songs and introductory scriptures. Downloadable licensed digital PDF containing up to 100 pages of plans for kick-off, enrollment, rehearsals, auditions, plus musical and spiritual activities for every song. 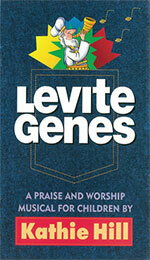 Gently Used Choral Book - Levite Genes - Grade A - SALE PRICE!! Songs, script, production notes & piano transcription - pristine. INVENTORY REDUCTION PRICE. Songs, script, production notes & piano transcription with clean interior, cover & reinforced spine. SALE PRICE!